Once I had moved from the short story collections and into full-fledged novels, I was given a number of Bantam-era novels from a used bookstore for a birthday. It was a mixture of them, no complete sets, meaning I owned a third of the Crispin Han Solo trilogy, a third of the Bounty Hunter trilogy, and so on. One of the books was the KJA scribed Darksaber, a lesser book of his, not as high-profile as the Jedi Academy Trilogy or as landmark as Tales of the Jedi. The book blew my mind in a lot of ways, I recall reading it through several times, and going back over my favorite chapters more often than that. Here’s the thing. I enjoyed so much of Darksaber, and it made such an impression on me that scenes are still stuck in my mind today. That’s more than I can say for most of the other books I had in that era (Slave Ship anyone?). When I think of the Bantam era, I think of the X-Wing series first, and then Darksaber, even before Heir to the Empire. 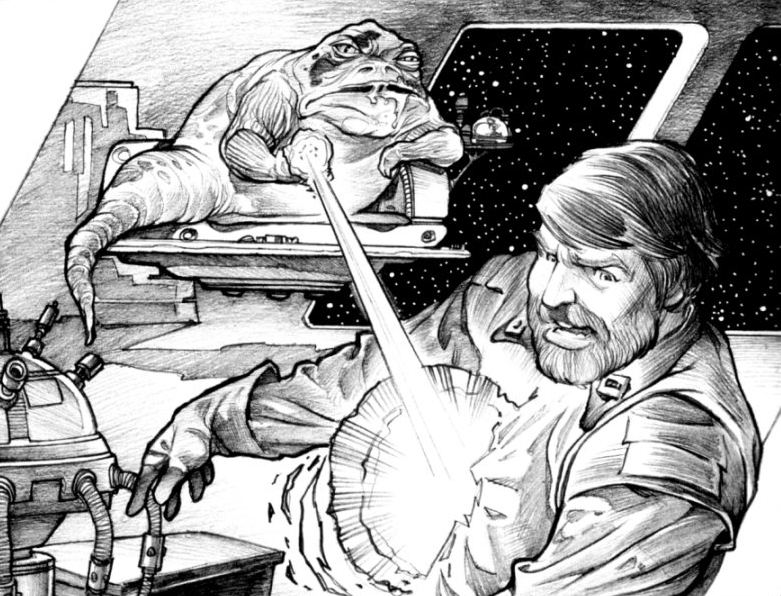 It so perfectly exemplifies the era of Star Wars publishing for me. The story, the characters, the plot(s), the twists, everything is just so pulp, so Flash Gordon or Buck Rogers. Let’s go through some of those elements and discuss them, shall we? We’ll start with the titular Darksaber, a Hutt-funded superweapon that’s basically the Death Star if you cored it like an apple. I love the idea of superweapon proliferation, and that the copycats would not be able to meet the level of “success” that the Empire had because of their own hubris. I wish it had happened more in the EU, to be honest. Durga the Hutt funds the weapon in the hopes of using it to become a galactic superpower. Unfortunately, because he’s also the cheapest Hutt in existence, he contracts the work out to the lowest bidder, with construction that moves in fits and starts with unsatisfactory results. Durga was also the first character in my EU experience to kill a character who had appeared in the movies, when he unceremoniously guns down a bound and helpless Crix Madine. Crix was spying on the Darksaber after getting reports of the weapon’s construction because, in true Star Trek fashion, the commanding officer is always the most qualified person to go out into the field on a dangerous and potentially deadly mission. That he actually did wind up getting killed is actually a rather decent twist, and certainly unexpected for the teenage me who read it. In Durga’s employ is perhaps the best character in the book, Bevel Lemelisk. I love Lemelisk, his mental tales of Palpatine’s cruelty at his failings are rather riveting and gruesome. 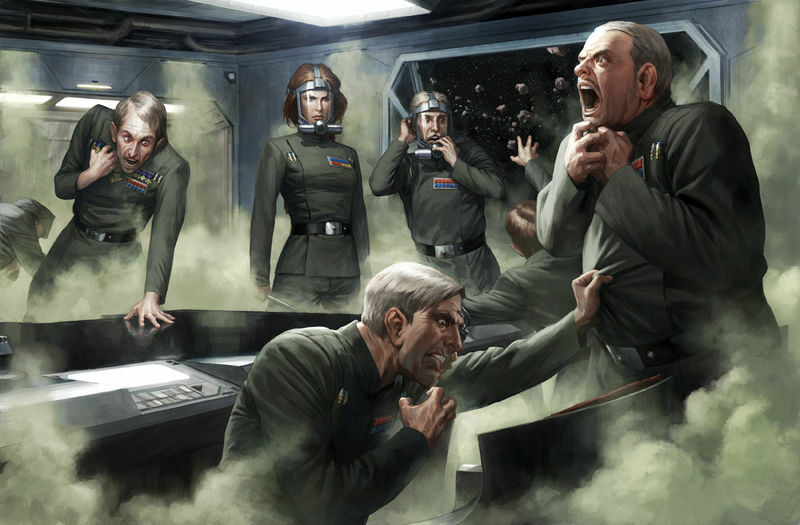 The concept of cloning a useful lackey over and over, transferring his consciousness to each new body as he slowly and horribly kills the previous one, is so very Palpatine. Lemelisk himself is a rather dark character as well, resigned, rather apathetic to everything, and ultimately welcoming death when it finally presents itself. Then we get into the Jedi plot. 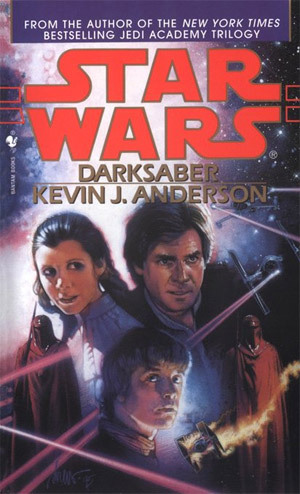 Darksaber is actually the middle book in a trilogy that started with Children of the Jedi, where we were introduced to Callista, a Jedi who had basically implanted her mind or soul or something into a computer. By the end of that novel, Callista and Luke had fallen in love and then Callista had basically taken over the body of a conveniently placed student of his and neither of them realized just how creepy that sort of relationship would be. Callista has a problem, though. She hasn’t been able to touch the Force since she took over the student’s body. So in true Bantam fashion, she and Luke go on a road trip, revisiting all of the places from the movies where he encountered the Force to try and re-kindle her connection to it. They go to a few different places, but the highlight of their journey for me is a stop on Hoth, where the two of them, along with a random and diverse group of hunters/tourists, reenact a zombie film within the remains of Echo Base as they are attacked by wave upon wave of Wampas, lead by the one-armed Wampa Luke met in Empire Strikes Back. It’s amazingly corny and contrived, but it’s also a better horror narrative than Deathtroopers. And we haven’t even touched on the pure, unadulterated narrative insanity of the third major plot of the book: the Imperial Remnant. Because this book is where we have Admiral Daala’s grand re-entrance into the narrative after the Jedi Academy Trilogy. She carves a swath of destruction through both the Imperial Remnant and, eventually, the New Republic while KJA thoroughly confuses every aspect of Star Wars capital ship deployment and combat. It’s both glorious and terrible to behold. Even the younger me that first read this book knew that something was up when she was put in charge of seventy-some Victory-class Star Destroyers and a black Super Star Destroyer, and failed to do anything significant. In other books you might think that everything comes together at some point, and all of the plots converge into one massive melee where the bad guys get their comeuppance and the good guys triumph. But not in Darksaber. In Darksaber, the titular weapon is destroyed well away from the battle between Daala and the New Republic, smashed to pieces by asteroids, rendering Crix’s sacrifice and the entire plot entirely moot. The arc that gave the book its title is completely ancillary to the majority of it, because somehow the idea of Daala taking command of the Darksaber from Durga was a step too far for KJA to go. I love Darksaber. It’s bonkers. It’s the same sort of love that I have for old Godzilla films from the 1960’s and 70’s, because it’s just so much fun. Sense and reason and the consistency of characters fall entirely by the wayside in favor of bombastic set pieces and outrageous, memorable moments. It’s the novel equivalent of a B-movie. Taking stories like this one into account is what helped me form my current opinion about Star Wars lit: so long as it’s entertaining, I’ll probably at least somewhat enjoy it. The worst thing that a Star Wars book can be is bland and unmemorable. While I will complain about KJA’s stories, as an editor, he is unparalleled. The “Tales from” series are actually some of the best of the bantam era.